From classifying galaxies to counting koalas across the country, recording rainfall or your own sleep habits, citizen science projects give Australians the chance to contribute to scientific research. The Minister for Industry, Innovation and Science Greg Hunt has announced $4 million worth of Citizen Science Grants over four years to support more opportunities for the public to collaborate with researchers on high-quality, nationally important research projects. Citizen science projects involve non-professionals taking part in crowdsourcing, data analysis, and data collection as part of scientific research. The idea is to break down big tasks into understandable components that anyone can perform. Citizen science is a great way for the general public to help scientists conduct real research as they learn scientific skills including observation, recording and analysis. Professor Alan Irwin of the Copenhagen Business School was the first scientist to explore the idea of democratising science to improve the relationships between science and democracy. In his 1995 book Citizen Science: A Study of People, Expertise and Sustainable Development, he argued against the idea that the public is ignorant on scientific matters and advocated for more two-way communication around science issues. Since then, hundreds of citizen science projects have been established around the world including those that measure and map biodiversity to others that monitor the impact of toxins on human health or other aspects of physical fitness using technology. Australians take a keen interest in citizen science and there are around 200 projects currently underway. These include longstanding catchment management and water quality projects like WaterWatch, the online climate monitoring project called ClimateWatch and biodiversity mapping projects run by organisations such as the Atlas of Life in Living Australia, The Great Barrier Reef Authority and the Atlas of Life in the Coastal Wilderness. Other successful community engagement programs that use citizen science approaches include the Wild Pollinator Count that invites community members to contribute to insect conservation in Australia by counting wild pollinators in the local environment and the DigiVol project that engages volunteers to help manage the Australian Museum’s collections via imaging specimens and transcribing, georeferencing and researching scientific data. Each year sees a major citizen science project run by leading universities and research organisations as part of National Science Week. This year’s Wildlife Spotter, saw around 50,000 people contribute 43,000 hours to identify wildlife snapped from over 2.7 million images from automatic cameras in diverse wild and urban environments from Far North Queensland to Tasmania. There have been over 429,000 tasks performed since the project was launched in August 2016, with the greatest contributor completing 92,000 tasks. In 2015, Galaxy Explorer saw 18,000 Australians assist with the classification of 225,000 images of galaxies for the International Centre for Radio Astronomy Research in Western Australia. Another recent example is Curtin University’s Eureka prize-winning Fireballs in the Sky that has attracted 24,000 people in 88 countries to report meteor sightings via a dedicated app. Scientists then use this information to compute the meteor’s orbit, contributing to planetary science and our understanding of the formation of the solar system. 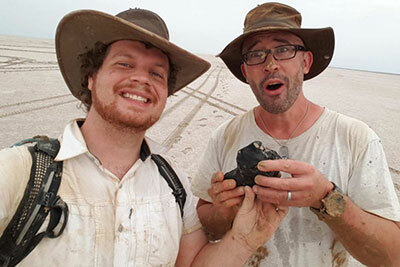 Just last week, scientists from Curtin university’s desert fireball network recovered a freshly fallen, 1.15kg, brick-shaped meteorite. The meteorite, that fell to Earth near Morawa in Western Australia, is estimated to have been formed around 4.5 billion years ago. It was found less than a week after sightings were reported via the Fireballs in the Sky app. After a consultation period, the Australian Association of Citizen Science (ASCA) was formed in 2015 to create a national voice for this growing network. With the support of Inspiring Australia, ASCA is now well established as a community that supports, informs and develops citizen science both in Australia and overseas. Its mission is to advance citizen science through knowledge sharing, collaboration, capacity building and advocacy. The benefits of community participation in scientific research have been recognised by the new citizen science funding announcement that Minister Hunt said will contribute to Australia’s national science and research priorities and increase science participation in new fields.